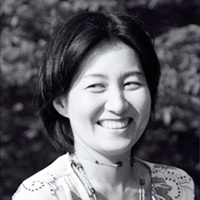 Koike Masayo–poet, essayist, short story writer, translator, and newspaper columnist– was born in Tokyo in 1959 and graduated from Tsuda Juku College in Tokyo. She has published numerous books of poetry, including Eien ni Konai Basu (The Bus that Never Comes) in 1997 and Mottomo Kannotekina Heya (The Most Sensuous Room) in 2000 (awarded the 15th Gendishi Hanatsubukai Prize and the 30th Takumi Jun Literary Prize, respectively), a collection of essays Okujo e no Yuwaku (An Invitation to the Rooftop) in 2001 (awarded the Kodansha Essay Prize), and a collection of short stories Kanko Seikatsu (Life Exposed by Light). Her range of interests extends to art and design, with one of the magazines that she edits regularly featuring her own drawings. The poems featured here are taken from one volume: Selected Poems (Vagabond Press, 2006). Translator Leith Morton is professor at the Foreign Language Research and Teaching Center, Tokyo Institute of Technology, and has published extensively on Japanese literature and culture.